The MP for Chatham and Aylesford, Tracey Crouch opened the event, and spoke about her new role implementing recommendations from the Jo Cox Commission on Loneliness. Plans were also enveiled about a new forum formed to take forward work on how to create a Dementia Friendly Rochester. Coming straight after Dementia Action Week, the day was organised by Medway Dementia Action Alliance - a formidable partnership of organisations and individuals across Medway working together to ensure that people with dementia are able to live well in our communities. They partnered with the Diocese over the event, which is committed to supporting those with dementia, particularly through our network of Anna Chaplains and Anna Friends, who offer support to the elderly and those with dementia in parishes across the region. During the day, speakers living themselves with a diagnosis of dementia or supported a family member spoke about their experience. Others shared their insights from clinical practice on topics such as: benefits of exercise; looking after your brain; and, making your wishes known for the end of life. A range of stallholders in a marketplace area gave advice on all aspects of living with dementia and showed examples of equipment and activities that help. Visitors were also able to spend time talking to an Admiral Nurse or pick up information from Age UK or the Alzheimer’s Society. 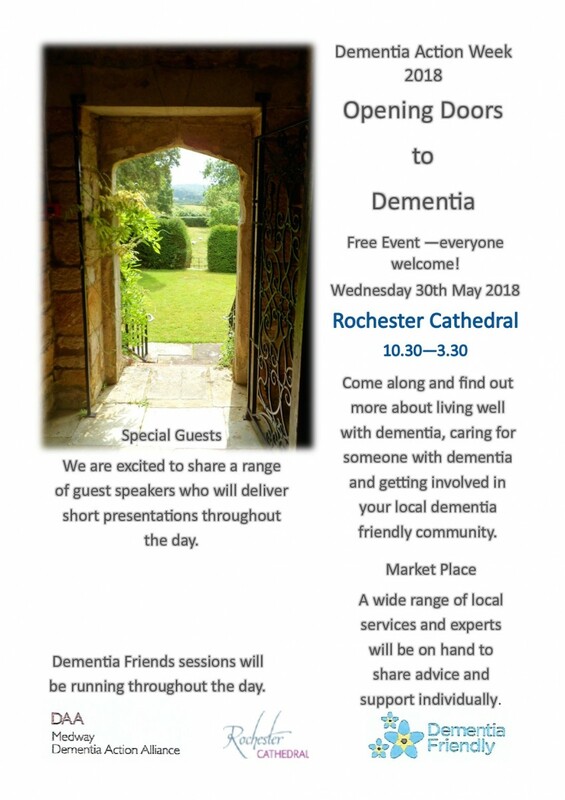 A short dementia friendly service in the Lady Chapel closed the event.